We turn banners from events like the AT&T Pebble Beach Pro-Am into backpacks filled with school supplies to support local students. Last year, we launched our Banners to Backpacks Program at the AT&T Byron Nelson. Now, we’ve decided to expand the program to include at the AT&T Pebble Beach Pro-Am. After the tournament, we will gather scrim – the material that wraps bleachers and scoreboards – and other materials to create at least 1,000 backpacks for local students. We’ll fill the bags with school supplies and distribute them just in time for back-to-school season in August. To promote the initiative during the tournament we upcycled all the caddie bibs used during the 2018 AT&T Byron Nelson into zipper pouches. These pouches are filled with golf tees and will be given to the players and other attendees. Through Banners to Backpacks, we’ll continue to upcycle signage from events we sponsor into materials that make a difference in the communities where we live and work. What makes upcycling different from recycling? The materials don’t need to be broken down before they’re reused. 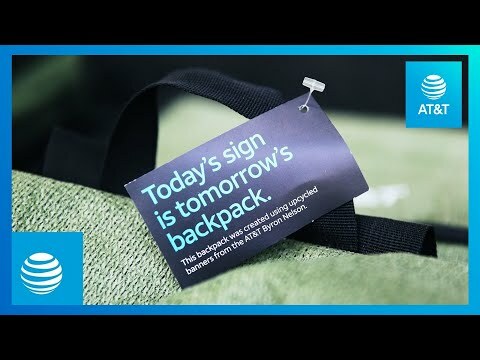 The patterns for backpacks and bags are cut directly from the existing signage. We were able to make 1,300 backpacks from 10,000 yards of signage and scrim at last year’s AT&T Byron Nelson. Our employees donated school supplies and volunteered their time to stuff the backpacks and give them to students in Dallas and Houston. We were also able to donate backpacks filled with books and toys to children in California affected by the Camp Fire. Learn more about AT&T’s social responsibility efforts at att.com/csr.